Never underestimate how much your driveway or entrance contributes to your house or property’s overall appeal. Curb appeal is a major factor when it comes to real estate value appraisals. The right driveway design improves the value of your home or Commercial Property. Driveways and entrances are often the first thing you see as you approach a property, thus it makes a prominent and luxurious statement. We love the challenge of creating the unique and custom design ideas or dreams for your Gate Systems project. Whether your gate project is big or small, basic or intricate, manual or automated, let Budget Fence and Gate Systems help you find your solution. We don’t just offer these services as a convenience or a side note to the fence business; we specialize in this category and have decades of experience we bring to the table- its all in our name. The manager of our Gate Systems department comes with the extensive past experience of having managed a company through which all available automated control systems on the market are purchased from. He fully knows and understands the ins and outs, and pros and cons of the many different available systems. With this knowledge, he guides, trains, and leads our staff to the most appropriate, and cutting edge technologies and installation methods in the industry. Our team is familiar with and can service most products on the market, even the ones we don’t currently choose to provide. Our friendly staff members are equipped with the knowledge to help come up with the optimal gate solution for your project. 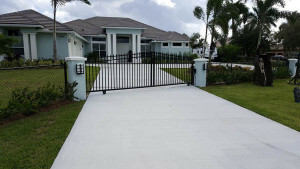 All of our Gate Systems come with professional installation to make sure you receive both quality product and service. Some of our many gate products include Chain link, PVC/Vinyl, Aluminum, and Wood as well as many other specialty options. Our gates can be installed using different styles based on customer needs for security, privacy, safety, access control requirements, building codes, and other regulations or eye catching design requests. Our knowledgeable staff and extensive experience allow us to handle any scale of residential or commercial gate project. Whatever the scale, we’ll get the job done right. Various properties, whether residential or commercial, need to have security parameters installed along their perimeters or boundaries. These security parameters come in the form of fences and gates. With gates being the point of entry and exit, due attention should be given to them when planning a property’s security parameters. Gates not only provide security but also contribute to the overall aesthetic feel. Automated gates allow our customers to enter their properties without having to get out of their cars to open manual gates – a clear advantage when it’s raining or late at night. It also closes automatically so you don’t have to be mindful of closing and locking the gate after entering. Landscaping and parking area capacity are no longer problems when you elect to install automated sliding gates for your property. Instead of being limited to swinging only in or out, slide gates allow landscaping and parking areas to not be affected, increasing your space. You can even utilize the space right next to the sliding gate because it will not take up a large area when opening or closing. Smaller properties greatly benefit by opting to go with sliding gates. There are instances where automated slide gates are better used than manual swing gates. Sliding gates are better for very wide openings in properties, especially in industrial or commercial ones, and for driveways that have an upward slope. Swing gates on the other hand can either be opened together or one at a time for easy access such as taking out the garbage. Design and manufacturing of these types of gates are done with the aid of precision technology. As such, they are built with durability and functionality in mind. These gates are built to withstand continuous or highly used and trafficked areas or locations. These gates are highly customizable and can easily accommodate most personal preferences or designs to enhance your properties exterior. You get to decide the gate’s size, material, and finish, along with its drive system, and safety devices. Also, having this particular feature can easily boost your property’s market value and increases its appeal should you wish to sell in the future. We can make your gate to any design to meet your properties specifications to ensure the perfect fit. The primary benefit of having an automated gate is that it is the simplest way to improve the security of your home or business. It is important that you choose a company with dedicated experience within the gate automation industry to do the job right. Poor installation or poor quality products can turn your gate project into a nightmare, instead of being an asset for the protection of your family or business. We have carefully analyzed the many available products, and installation methods and have aligned ourselves with only the best products and practices in the industry. The line of products we recommend were selected to ensure the integrity of your Gate System, and the long term success of your expectations. 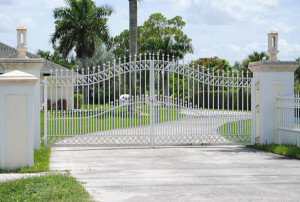 Budget Fence and Gate Systems has been providing customers with effective and high quality gate and gate automation products and services since 1950. Whether you are a business owner or management company looking to secure the assets of your company, or a concerned individual about the safety of your home, we have the right gate automation solution to suit your needs. Our highly skilled and trained Gate System technicians can diagnose, service, or repair issues within your existing systems. We also provide a full line of available Gate operators, access control systems, intercom systems, and security surveillance offerings. Our access control security solutions provide a wide selection of card readers, programmable keypads, wireless keypads, and Bluetooth technologies ensuring that only the right people have access to the property. When it comes to installing a gate system at your residential or business property, assessing the risk of your property is the first step. There are several different products that can improve the security of your property. With the advances in technology and more affordable prices than ever available, you can enjoy comprehensive security system for your property. The installation of fencing should be the first step to securing your property. In doing this, you will be able to regulate the flow of visitors to your property through one central access point. The proper barrier gate and automation is a vital part of this step. This will allow you to have more stringent control over the people that enter your property. Gate automation allows you to first identify your visitor and the nature of their visit before opening the gate via remote access. Other benefits of automatic gates include the safety, security, and convenience of opening and closing the gate from inside your home or property in many cases. If you would like to find out more about the products and services that Budget Fence and Gate Systems has to offer and how we can improve the security of your property please contact us to meet with a project design consultant. With a wide range of gate solutions, and decades of creativity and expertise, we are a safe choice for your investment. Meet with one of our knowledgeable project design consultants to assist in carefully considering your choices. Our experienced project design consultants can meet with you to discuss any design elements and security requests you wish to incorporate into your installation. We will listen to your ideas, needs, or concerns to provide a comprehensive plan of action to accommodate them. Throughout this process, we can provide pictures, installation techniques, and recommendations as a solution to your project. Please refer to our impressive resume of high end security needs clients who have elected to repeatedly trust us with their projects on our about page. 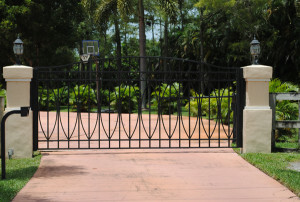 For all of your Gate, Gate Automation, Access Control, and Security needs in Palm Beach, Martin and Broward Counties please call the experts at Budget Fence and Gate Systems. In addition to new systems installation, we provide diagnosis, service and repairs of existing systems.